Epistemic status: High confidence in technical validity of model, low confidence in biological applications. The main reason I haven't been very active on this blog for the past year is that I've been finishing up my PhD thesis. Since it was a big project, I think it deserves a little real estate on this blog of mine, but I don't want to rehash my whole thesis here since that was the point of publishing the dissertation. What I want to do in this blog post is outline the big idea behind my thesis and a couple of the fun things that I did to illustrate it. How does an organism change its shape? 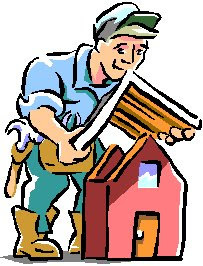 Imagine you had a shed filled with the most basic tools that you could use for constructing houses, say it just had a ton of hammers and saws. Now, lets say that every day you deliver more raw materials like lumber and nails to that shed. Would you ever imagine that you could come back nine months later and see that that shed had turned into a one bedroom house with a garage? What if you came back twenty years later and that shed had turned itself into a three story mansion with a pool out back? Would you think that's just impossible? Well that's basically exactly what happens every time a human embryo develops into a newborn baby and then, later, a fully grown adult. You start just with the basic tools for life in a simple package, and over time that simple embryo gets remodelled piece by piece into the person reading this blog post right now. Now, if you are a tinkerer like me, you might guess that all this would take place kind of the same way humans build stuff. We might start with something simple, but when we want to change something, we'll knock down a wall and put up a newer, better one in its place. Or we'll build a separate free-standing building next to the old one and then connect them together after you have both structures made. There are a lot of ways to build things, but the point is at the human scale of construction, we normally work by building something from the ground up with tools from the outside. Then when we want to revise, we build something new and attach it to the old thing or knock the old thing down when it isn't useful anymore. There are no "outside tools" or an independent construction crew because the organism is simultaneously the tools, the builders, and the structure being made. An individual cell can never totally knock something down and build a new version all at once because that would compromise its current function. When we are talking about individual molecules it is really hard to coordinate building things separate from the current cell. On that scale anything you tried to build would quickly float away from the construction site. So how do organisms overcome these obstacles to grow and change their form? Well, basically they do it by constantly making minimal modifications to their own structure, molecule by molecule, until they wind up with all these incremental changes adding up to large scale development. The analogy with builders is if you would move a wall by taking out one nail at a time, slipping the board as far as you can, and then renailing it before moving on to the next nail. We'll see how this works in a minute, but to understand just how they manage to rearrange their own internal parts without any outside help, we have to take a look at the basic building materials of the cell. What's a cell made of? 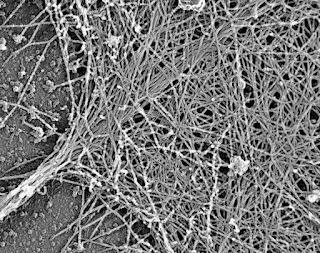 The structure of almost all the interesting cells in the human body is a big, disordered cage-like web of tiny, molecular fibers made of a protein called actin. I like to compare it to a messier version of a Zeppelin frame. In this vizualization I made as part of my dissertation defense, I take you on a little tour inside an egg shaped cell to see the orange actin filaments holding the cell together. The outside coating of this Zeppelin-like cell is a layer of oily goo, called the plasma membrane. On it's own, this oily layer isn't capable of providing much structure at all. 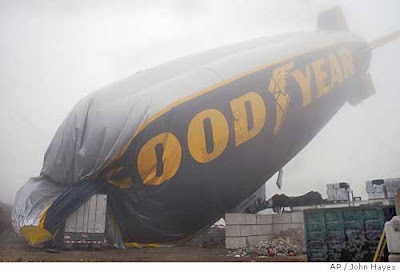 Ultimately, if this was all that was holding cells together, a cell (or a Zeppelin) would just flop over in a little puddle of mushy goo (or a deflated blimp). 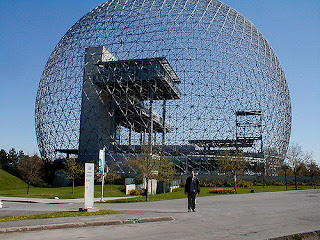 What makes the cell strong and able to hold its shape is the cage of molecular fibers that get stuck together by other small sticky proteins to create something like a disordered version of a geodesic dome. 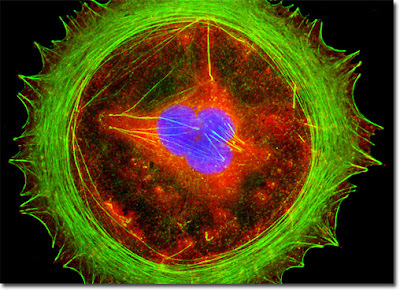 Inside this cage of actin filaments, the rest of the cell's machinery, like DNA, ribosomes, and mitochondria are free to do their work, largely protected from outside forces. As you can probably guess, it is by rearranging this web of actin filaments that organisms are able to grow, divide, and generally change their shapes. But before we get to describing how the cell does that, lets take a quick trip into an ancient philosophical discussion that helps to illustrate this basic physical system. If you know your ancient Greek mythology, you might remember Theseus as the smarter-than-your average hero of ancient Athens. What made Theseus interesting was that he often had to rely on a little cleverness to make his way through (as compared to that dumb jock Hercules). He was most famous for navigating the labyrinth at Knossos and slaying the Minotaur, and he's generally considered to have set up Athens into the ancient model of democracy. But anyway, this story isn't so much about Theseus as much as it is about his boat. 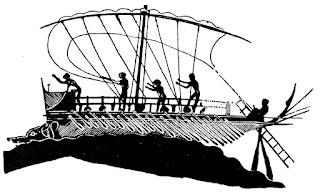 You see, since Theseus was such a celebrity around Athens, after he died, people kept up maintenance on his ship and sold tickets to go sailing on it. But as time went on, one or two of the boards would get rotten, and so someone would see that those boards were going to cause the boat to sink and they'd replace them. Then a couple of years later, a few different boards would start to rot and somebody else would go and replace them. And every couple of years, this would continue so that there were always a few old boards being removed and a few fresh boards being added. Now this continued for centuries, until eventually somebody noticed that only one of the boards on the boat was actually original anymore. And what's even worse, they noticed when they looked at some old drawings that the layout of the boat wasn't even the same anymore because each time they brought on new wood they would slightly alter how it fit onto the boat. Now this was ancient Greece so there were a ton of philosophers around (I'm pretty sure philosophy was, like, a quarter of Athens' GDP). And the philosophers liked to point out that pretty soon nobody should be wasting money to go see that boat because it wouldn't be the same boat anymore. Now everybody understood that philosophers are generally kind of pretentious buzz-kills anyway, but they also had to admit that they were kind of right. The people selling tickets to sail on the ship of Theseus were bummed because this started to hurt ticket sales so they tried to hatch a plan to get the philosophers to agree that it was still the same boat. Fortunately, they'd taken all the old rotting boards and piled them up in the same place over the centuries. On that spot, the boards had already decomposed back into soil, and a bunch of new trees had sprouted up and grown. So the people selling tickets to ride Theseus' ship took the wood from the trees that grew from the ground where the original boards rotted and started to incorporate those boards back into the modern ship. And so they asked the philosophers, "Now since, it's all the same material*, wouldn't you agree that this is still the same ship?" And some of the philosophers agreed and some didn't and this led to a philosophical conundrum about the nature of being... but that is a problem for another kind of blog. The reason I brought this story up was to illustrate the way in which cells remodel themselves over time. 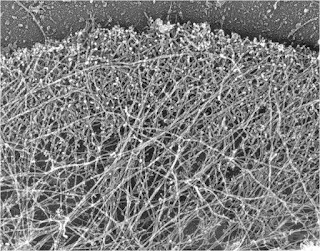 Cells break down their actin fibers one at a time and then use the broken down material to build new fibers which they incorporate in different locations. This leads to a slow remodelling of the whole structure without ever losing the overall integrity. My whole PhD was basically dedicated to using a computer simulation to recreate the molecular processes that cause cells to morph from one shape to another. Although writing the model itself involved a lot of math and computer code, the basic principles underlying the model are pretty simple to explain. We already went over how the structure of the cell comes from actin filaments sticking together with other smaller, sticky proteins. To get a clearer view of how this actually looks in a real cell here are a few electron microscopy images. In reference to our analogy of moving one board around at a time to change the structure, the next question that arises is how would the cell move these structural actin filaments around in the first place. The way these filaments get moved around is ridiculously amazing. Every cell is teaming with nanoscale molecular motors called myosins. These myosins are tiny clumps of protein that burn chemical energy in the cell to generate little tiny tugs on actin filaments. This GIF shows what it looks like for one motor to pull against an individual actin filament. The colorful thing that is moving around is the myosin. By adding up hundreds of little tugs in different places around the cell, we end up with cellular scale motions. These motions can pull larger protein complexes around the cell or they can even pull against the surface of the cell to cause the cell to pinch in the center for dividing. In this video you can see the actin filaments in white all get pulled into a central ring, and that ring is pulled by the myosins toward the center to pinch the sides of the cell inward. What's even more crazy is that this microscopic system for moving around molecular components in the cell is actually evolutionarily conserved with our larger scale system for moving our muscles. Over time, multi-cellular organisms repurposed the function of actin and myosin to generate specialized muscular tissues. Every time we move, it's thanks to the sum activity of billions of actins and myosins working together to produce the macroscopic contractions in our muscles . But back on the molecular scale of the cell, all these tiny tugging motions produce highly localized contractions within the cell. In my thesis research, I simulated the mechanical properties of actin filaments and myosin motors to reproduce local contractions of patches of simulated cellular material. In thee next animation, you can see one of the many thousands of simulations I ran to test the model and make predictions about how these cellular materials might behave with different concentrations of motors and filaments. So (after proving that the simulation makes sense and works right) the next question I asked was whether this model was enough to explain a significant amount of biological information? Could I predict how the cell would move around its structure just by employing my equations for simulated motors and filaments. Well it turns out it isn't quite that simple. If we just left these motors to their own devices, they would eventually either lock up the structure or tear it apart. To show this some of my colleagues, actually mixed purified myosin and actin together an recorded what happened under the microscope. As you can see in this next movie, the patch starts to deform a little bit, but before long, it winds up ripping itself into little chunks. Actin and Myosin reconstitution tearing itself apart from Murrell et al. To keep the cell alive and able to change shape, we have to introduce one more property that lets the actin network refresh itself as it is being moved around. We find that as the motors move filaments around they end up wearing the filaments out so that they can't be moved around too much before they start to break down. So to solve this problem, just like in the ship of Theseus up above, the cell intentionally removes the old actin filaments and uses the material to rebuild fresh filaments that can be used to reconstruct. And also like in the ship of Theseus, the cell is doing this one filament at a time. To actually see this breakdown occur, my colleagues and I developed a method that allowed us to measure how long these filaments lasted before being broken down. We used single-molecule particle tracking movies like this one to watch individual pieces of actin get incorporated into the actin web, sit in the structure for a little while, and then get broken down and disbursed. In this video, you can see the flickering molecules as they get added and removed from the structure. Single molecules of actin from Robin et al. I started calling this phenomenon filament recycling because, to me, it seems like the perfect analogy. The cell is actively breaking down its old structural material into its constituent parts and then reassembling those parts in order to rebuild its structure. The name still hasn't caught on (filament turnover seems to be the more popular jargon), but I'm hopeful that I'll be able to check back in on the field in a couple of years and see that they adopted my name. One of the most interesting things about doing a PhD is that you get to be the first to try something. For my thesis, I got to be one of the first people to incorporate this recently discovered biological process of filament recycling into my mathematical model. This movie shows what my simulations looked like when I added in recycling. This bears a striking resemblance with how the actin and myosin look in real cells. The main takeaway of this work was that adding recycling prevented the cell from tearing itself to shreds. Beyond the basic observations, using a mathematical model allowed me to make a ton of predictions about how cells work, and it provided the field with some worthwhile ideas to explore in designing new experiments. You can view the preprint of the paper I wrote with my colleagues describing this research if you are interested to learn more. But most importantly, that wrapped up the body of work that my thesis committee decided was enough to qualify me for a PhD. Like Theseus or any hero, just when you thought it was over, there's always a little more to be done. The final step in getting a PhD is to write a massive document and then stand up and give a talk about the work you have done over the years. The talk wasn't that hard for me, but, man, writing the paper was impossible. For some perspective, writing up this blog post took me about 5 hours split up over two nights. Writing up my dissertation took me over two years and I don't even want to think about the number of hours. It was gruelling and arguably not really worth it. Fortunately, I version controlled the whole thing on GitHub to keep track of the process. Using the Git PDF Visualizer code that I wrote about on this blog last year, I was able to make a cool little video showing the progress.You can see a couple of big lulls when I worked on analyzing datacenter efficiency and building an automated doctor. The finished document was published on some completely ridiculous basically inaccessible website, but you can get a copy here if you're dying to read it. Enjoy. *I know that most of the material in trees comes from CO2 in the air, and not decomposed material in the soil, but we'll just pretend that ancient Athenians didn't know that so the story still works.